13. “If you drink alcohol, drink sensibly.” Is this guideline still appropriate? Background: Alcohol abuse remains one of the most serious substance abuse disorders in South African society, resulting in inordinately large social, economic and health problems at all levels of society. Alcohol consumers in South Africa are estimated to drink 16.6 l per annum, with a per capita consumption of 7.1 l. South Africa has one of the highest rates of deaths attributable to crime, violence, traffic accidents and HIV/AIDS in the world. These rates relate directly to the high prevalence of alcohol abuse and risky drinking patterns. A food-based dietary guideline that appears to encourage alcohol consumption is not in the nation’s best interest. Method: A search was conducted of websites supported by the World Health Organization to find published literature on substance abuse in South Africa. The website of the Medical Research Council of South Africa for studies on the social impact of alcohol abuse on humans was also reviewed. The search terms “alcohol guidelines”, “alcohol abuse”, “noncommunicable diseases”, “health benefits of alcohol”, “moderate drinking”, “alcohol” and “intake patterns” were used. Studies published between 2002 and the present were reviewed. Results: Based on evidence of the past two decades, messages that convey the positive health benefits of moderate alcohol consumption (e.g. increased levels of high-density cholesterol) should be promoted and even encouraged in moderate drinkers (i.e. one alcoholic drink per day for women and a maximum of two drinks per day for men). Moderate drinking is not encouraged in those who do not consume alcohol at all. Nutrition educators should emphasise the negative consequences of alcohol abuse. 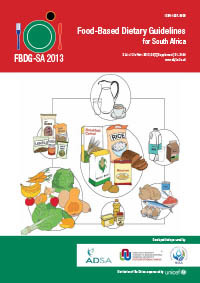 Conclusion: The current food-based dietary guideline “If you drink alcohol, drink sensibly”, issued by the South African Department of Health, should not remain as is.